Please click on "CONTINUE READING" to see the entire description of the set. 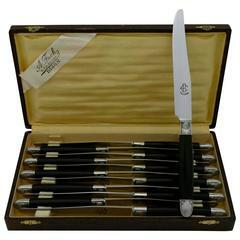 This service includes twelve dinner knives and twelve dessert entremet knives with neoclassical decoration. Black Horn handles, silver ferrules and collars. Stainless steel blades. No monograms. The service is presented in a box. Measures: 9.84 (25.3 cm) dinner knives 8.27 (21.5 cm) dessert entremet knives Total weight with box: 1530 grams. The condition is very good for this set. Micro-scratches from normal use. A master cutler made a complete cleaning and polishing, all have a Fine luster. The blades are stainless steel and in very good condition. The twelve dessert knives are intact. There are one dinner with three micro chips in the Horn handle and a few of the caps have slightly pushed in ends. Nothing serious. We deal with original genuine antiques over 100 years old. This set is not subject to import tax to the US. We ship purchase Mondays through Friday (outside French holidays) paid items will be shipped on the first shipping day after payment is received. After registration of your order and confirmation of your payment, your order is prepared and packaged with the utmost care to ensure you receive the items in perfect condition. Your package will be insured for the total value of your purchase (s). Tracking numbers (French and international) of your package will be sent by e mail to track your package online on the french website then on the website of postal service in your country. Please only by email for more information, extra detailed description or photos. We are very pleased to help. Precise conditions of the set at the bottom of the ad.